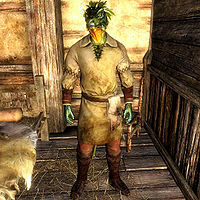 Talen-Jei is an Argonian living in Riften, and works at the Bee and Barb. He reveals that he is smitten over Keerava and is planning to marry her. You can offer to help him complete his wedding ring in the Black Marsh tradition. Talen-Jei wears a set of barkeep clothes along with a pair of shoes. He carries his key to the inn, a belted tunic, and a selection common loot and gold. He also carries one bottle of the Velvet LeChance, White-Gold Tower, and Cliff Racer wines. In combat, he relies on a leveled dagger which can be up to Elven in quality. As you enter the tavern, Talen may greet you with "Welcome to the Bee and Barb, milord/milady. If I can interest you in one of our special drinks, you let me know." or "Is there something I do for you?" When exiting conversation, Talen may say, "If you'll excuse me, I have other things to attend to." If either Taking Care of Business is completed or Keerava is dead, Talen-Jei will be understandably angry, greeting you with "You have some nerve coming back here after what you did to Keerava." and ending conversation with "Just get out of here." When you give a religious pamphlet to Talen-Jei, he will be appreciative. "Interesting. I'll look it over. Thanks." He has a negative view of the Thieves Guild, shown when he tells you about the Guild. "They're vermin... garbage. They're exactly what makes this city such a horrible place to live. How appropriate they should live in the Ratway with the rest of the trash." You can also ask him what the Ratway is, and he'll describe it with "Disgusting. Ruined sewers filled with goodness knows what. There's an entrance down by the canal, but I'd highly advise you stay out of there... its the Thieves Guild's territory." To start Sealing the Deal, you must ask Talen-Jei how he met Keerava. He will reply, "I met her when I wandered into Riften a few years ago. Been smitten with her ever since. In fact, I'm thinking of asking her to marry me." He'll then explain that "In Black Marsh, tradition dictates we present a potential mate a unique wedding ring to represent our future bond." and tell you what he needs. "I already have the gold band, but all I need are three flawless amethysts to complete the setting." You can suggest that you could find those for him, and he will be grateful. "I was hoping you'd offer. I didn't think it was my place to ask such a favor of you. I thank you." Telling him that you can't help him there will have him say, "I understand. Hopefully I'll be able to save my meager earnings up to buy them one day." Once you have the amethysts, you can give them to Talen-Jei, who will be immensely grateful. "I... I... I don't know what to say. Such kindness is unheard of in these times." He will give you a random potion in return, saying, "Here. I want you to accept this as payment for your sacrifice and I... well, we both thank you." You can also ask Talen-Jei to tell you about the wedding ring. He'll explain, "Every Argonian wedding proposal band is supposed to have three flawless amethysts as part of their design. Two of the gems, the ones on the outside, represent the couple to be married... one for the husband, one for the wife. The amethyst in the center represents The Hist, the entity that all Argonians consider a sacred part of our lives." During A Cornered Rat, you can inquire with Talen-Jei about your mission, saying that you're looking for an old guy, hiding out somewhere in Riften. He will direct you to the Ratway. "Never heard of anybody like that. But if you want to hide out in Riften, the Ratway's where you'd be. There's a sort of tavern down there, the Ragged Flagon. Where all the lowlifes in Riften get drunk and knife each other." He'll also warn you with "You might try there, if you can get through the Ratway alive." During Taking Care of Business, you can approach Talen-Jei for help. He will be less trusting than usual, however, asking, "What do you want?" You can now mention that he might want to talk some sense into Keerava, which will be replied to with "With the rumors going around about how poorly your Guild's been doing, she's become much too bold. I'm not that foolish. The last thing I want is a war with your people." You can tell him that he should then help you convince her to pay, and he will reluctantly cooperate. "Look, I'm only telling you this because I care for her. Don't mistake this as acceptance for what you do. Keerava has some family at a farm just inside of Morrowind. If you mention you know about it, she might just listen to you. Just please, don't harm anyone. I couldn't bear the thought." After you receive your dues from Keerava, Talen can be found dismissing you with "We got the message... now just take your business elsewhere." Talen-Jei: "I don't know Bolli. It's getting dangerous outside the walls"
Talen-Jei: "That's not funny, Bolli. People are scared." Even after Sealing the Deal has been completed, Talen-Jei still may show some disdain towards you for your actions during Taking Care of Business. If Talen-Jei dies before the Taking Care of Business quest is started, it may not start at all. This issue has been addressed by version 1.1 of the Official Skyrim Patch; Talen-Jei is made essential. Esta página foi modificada pela última vez à(s) 21h12min de 27 de fevereiro de 2014.